A year into blogging, has it really been a year? Initially, it was hard- staring at the screen, waiting for an idea to float by. The times I'd bake something nice and then forget to click a picture. I didn't tell anyone I had a blog, then I told a few friends, then my students and then friends would call up to say that they had read the blog. To all of you who have taken the time to stop by, thank you. And I hope you will keep coming back. I thought I would bake a cake for the occasion but my friend from Fruitmarx, put paid to those plans. Last Saturday morning, he sent me shimeji mushrooms, snow peas, sweet peas and some other vegetables. And at the bottom of the bag I found this- a taro yam. If I had nothing else to do that day, I would have made yam puffs. So it sat in the fridge till today when I could finally make my favourite kind of dim sum. The natural progression of yam preparation- peeled, sliced and steamed. 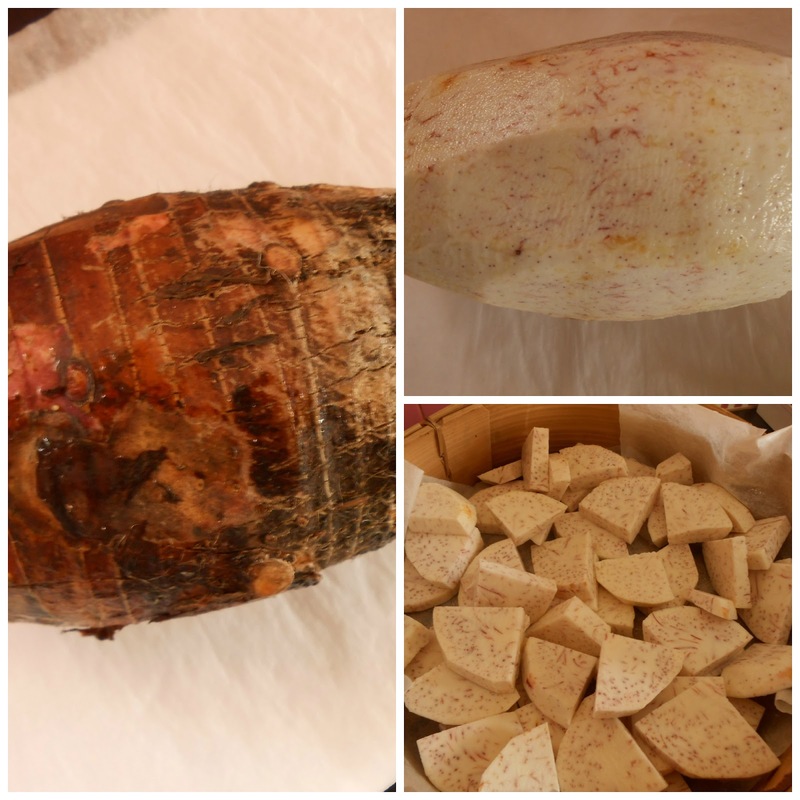 Unlike smaller yams, this one does not cause an itch but you have to peel it well as the toxins are present just under the skin. Slice the yam, wash it and steam for about 20 minutes or till cooked through. Mash the yam in a bowl, mix in sugar and salt. And shortening. In another bowl, measure dim sum flour, pour boiling water over and when cool enough to handle, knead till smooth, add the yam mash to it and mix well to get a smooth dough. Make the filling(recipe follows), divide the yam into small balls, stuff with filling and deep fry. An amazingly crunchy, feathery crust, soft yam inside and then the filling full of minced chicken, prawn flavoured with sesame oil. Peel the taro, cut into 4 and slice thin. Wash and place in a steamer basket, steam for about 20 minutes or till cooked. Mash when hot along with salt, sugar and shortening. Keep aside. Put the dim sum flour in a bowl, pour over boiling water. When cool enough, knead to a smooth dough. Mix the yam paste and dim sum paste together till well combined. Shape into 20 balls, keep covered. Heat 2 tablespoons oil in a pan, lightly saute onions and garlic. Add chicken and when meat changes colour, add chopped prawns. When the prawns are pink, add in the peas, oyster sauce, soya sauce, salt and pepper to taste. Add in the sesame oil. Mix cornflour with water, add to the pan and stir till thick. Turn off the heat and keep filling aside to cool completely. Make a depression in each yam ball, put in some of the filling and close well. Heat 2 cups oil, deep fry the yam balls, 2 at a time. When one side is done, turn the balls around gently until they are evenly browned. Scoop out and place on kitchen paper.